Middle school in space! An alien dog! A mad scientist! 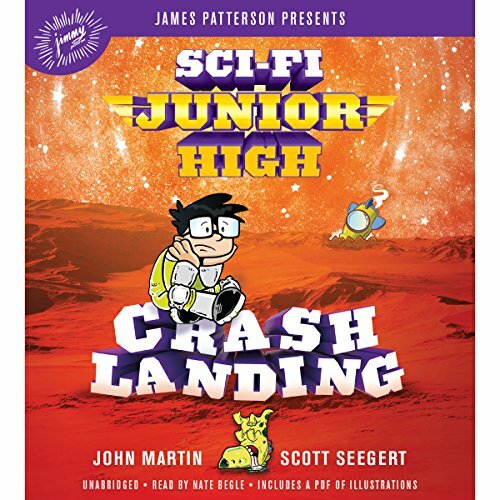 Sci-Fi Junior High is galactically good! James Patterson presents a hilarious space adventure featuring an average human kid getting into a universe of trouble. Kelvin is the new kid at Sci-Fi Junior High - a floating space station filled with alien kids form across the universe. And he arrived just in time for the annual school dance: The Galactic Get Down! Cue mad scientist Erik Failenheimer's escape from his asteroid prison, an army of Pinions (any similarities to the Minions™ is purely coincidental), and a battle to save Sci-Fi Junior High from imminent doom. Let's dance! "Saving the universe has never been so much fun!" - Gordon Korman, number-one New York Times best-selling author of 39 Clues and Masterminds on Sci-Fi Junior High. Praise for Sci-Fi Junior High: A 2017 Parents' Choice Award® winner!